...you should know about Zacchaeus. Zacchaeus was a little man. And Zacchaeus was a rich man. And nobody liked him very much. ...mostly because he got rich taking money from other people and giving it to the Romans. Nobody liked the Romans much either. That was because they came in from another country like a bunch of big bullies. They came with all their soldiers and swords and spears and stuff and made people do things they didnt want to do, like give them money. That's what Zacchaeus did. He collected money for the Romans. They called it "collecting taxes." Some of the money he gave to the Romans - but lots of it he kept for himself. And thats how he got rich. And Zacchaeus was a little man... without a lot of friends. Zacchaeus lived in a town called Jericho a long time ago. You might remember Jericho, if you heard the story about the walls that came tumbling down when the trumpets blew. But that was way before Zacchaeuss time. ...Zacchaeus looked down the dirt road that came into Jericho and he saw a crowd of people coming his way. Back then, everybody was taking about a guy named Jesus. Everywhere Jesus went, people who were sick got better, people who couldnt walk could walk again, people who were blind could see again. Jesus was a pretty amazing guy! And everybody wanted to see just who this Jesus guy was. Including Zacchaeus. The only trouble was, everywhere Jesus went there were always crowds of people all around him - and remember, Zacchaeus was a little man. He knew that hed never be able see over a great crowd of people. Zacchaeus ran up to the edge of the crowd and stood on his tiptoes to see what the big deal was. But all he could see were the backs of peoples heads. He tried jumping up and down. He bounced from one side and then to the other. But still he couldnt see. But then, on one lucky bounce, he saw the man at the center of the crowd. It was Jesus! Zacchaeus tried to push his way through the crowd, but everyone wanted to see Jesus, and they wouldnt let him through. What could he do? He wanted to see Jesus too! Then Zacchaeus turned around and saw a sycamore tree growing right beside the road Jesus was walking along. He ran on ahead and climbed up the Sycamore tree. He didnt care if he looked silly or not. He wanted to see Jesus! Sure enough, Jesus stopped right under the sycamore tree. 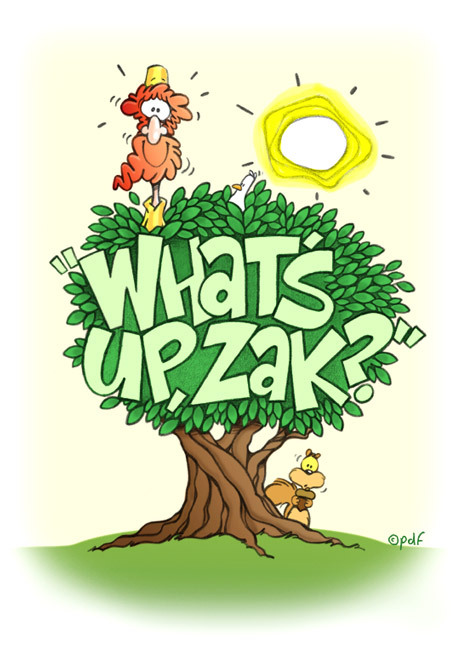 He looked up, and there was Zacchaeus peeking through the branches. 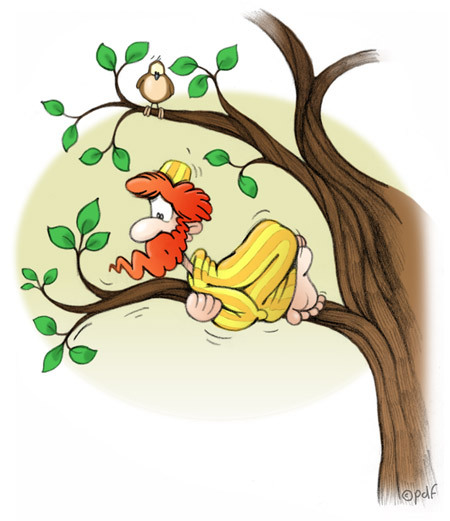 Zacchaeus! Jesus said to him, Hurry down from there! When his feet hit the ground, he was so happy he nearly did a little dance! But thats just what Jesus does to people. Jesus laughed and slapped his arm around Zacchaeuss shoulder, and together they started off towards Zacchaeuss house. But the people in the crowd were not so happy. This man is a sinner! one woman said. He cheats and steals from his own people! said an old man. Jesus was going to be a guest at his house. And what do you do when you are expecting company? You clean things up! Thats just what Zacchaeus did. Only he cleaned himself up on the inside first. Zacchaeus wanted to make things right for Jesus. He was so happy that Jesus wanted to come to his house, he wanted to make Jesus happy too. Jesus said to Zacchaeus, Today salvation has come to this house! Your life was all wrong, but now it is all right. You were lost, but now you have been saved! Zacchaeus was a little man, but now he felt ten feet tall! Jesus knows you too! Jesus knows you by name, just like he knew Zacchaeus. He wants to come and tell you how much he loves you. He wants to tell you the good news of his home in heaven. He wants to laugh with you and cry with you, and be with you no matter what. But Jesus cant exactly walk up to your front door and ring the bell. It would take a LONG time for Jesus to walk up to every house in the world! Youd be all old and wrinkly by the time he finally got to yours... and he wouldnt be able to stay very long. There are a LOT of houses in the world to get to! Back when Jesus stayed at Zacchaeuss house, all the other people grumbled because each one of them wanted Jesus to stay at THEIR house. But when Jesus was on earth, he just couldnt stay at every house every night. Thats why Jesus went to heaven. Jesus went to heaven so he could send his Spirit to live with each of us - all at the same time! Of course, you cant see his Spirit. But you cant see love either. You cant hear it or smell it or touch it. But you know when love is there. Thats how it is with Jesus. When Jesus comes to you, you cant see him, or hear him, or touch him. But you know that he is there. All you have to do is ask him in!